Silver Bull Resources, Inc. (OTCQB:SVBL) (TSX:SVB) ("Silver Bull") announces the results of its recent exploration drill program targeting deep structures on the Sierra Mojada Project in Coahuila, Northern Mexico. In September 2016 the Company completed a 590 line kilometer airborne magnetic geophysics survey over the main deposit at Sierra Mojada targeting structures at depth. In addition, over 20,000 meters of drill core was re-logged over areas of high interest and a new structural model developed for the main deposit. This work identified a number of deep structures coincident with known high grade historical silver and zinc mines in the area and were the main targets for the drill program. Five exploration holes targeting these deep structures underneath the main zone of mineralization were drilled for a total of 3,270 meters drilled and the results are shown in the table below. B16002 833m 360m of intense silica alteration. 50m @ 0.15% Copper and 27.1g/t silver from 220 meters including 38.4g/t silver over 7 meters. B17001 589m 180m of intense silica alteration. 115m @ 0.25% Zn from 165 meters including 29 meters @ 0.1% lead. B17002 515m 81m @ 0.64% Zn from 74 meters including 17m @ 65g/t Ag & 41m @ 1.4% lead. Although no significant high grade mineralization was intercepted in these holes, zones up to 460 meters of silica alteration resulting in total replacement of the original country rock with silica in places were intercepted, and is typical of the sort of alteration expected proximal to an intrusion, the genesis of the mineralization already defined at Sierra Mojada. Highly anomalous zinc grading between 0.1% and 0.7% is often associated with this silification as well as lesser, silver, copper and lead. These zones were also highly anomalous in manganese, grading up to 1%, which is also typical of carbonate replacement systems, which when combined with the low grade zinc, silver, lead and copper is thought to represent a lower grade halo around the main deposit and provides a powerful vectoring tool for future drilling. A map showing the location of the drill holes, in relation to the main deposit is shown below. Tim Barry President & CEO of Silver Bull states, "This was pure exploration drilling and we gained extremely valuable insight into the geology of the Sierra Mojada deposit, and now have a number of vectors on where to drill next to target the sulphide feeder zones. These were the deepest holes drilled at Sierra Mojada to date on the project and we have gained a significant understanding on the mineralizing system. When one considers the size of the current resource already defined at Sierra Mojada, coupled with thicknesses of over 400 meters of intensely altered (silicified) country rock, as well as the yet undrilled wide spread mineral occurrences and historical workings over a 25 kilometer strike on the project, it suggests we are on the edge of an extremely large system that requires more systematic exploration and which may represent the true prize at Sierra Mojada." 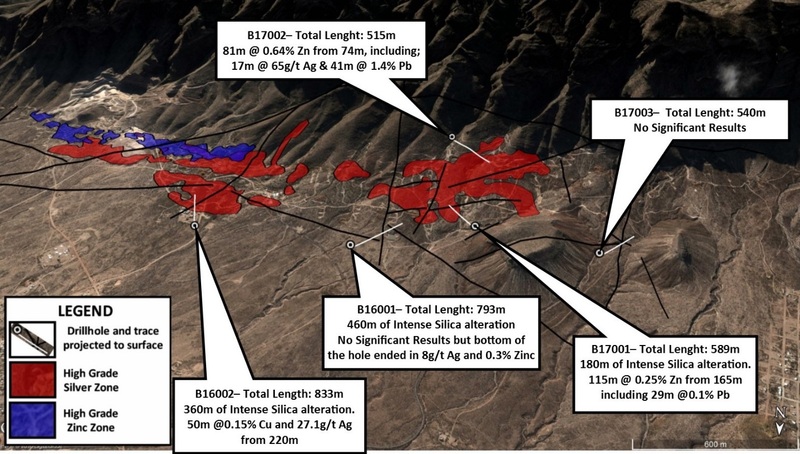 In addition to silver mineralization reported at Sierra Mojada, Silver Bull has also previously defined a discreet and separate high grade zone within the project of "measured and indicated" zinc oxide mineralization of 10.03 million tonnes grading 11% Zinc (at a 6% cutoff grade) and which represents one of the largest undeveloped zinc resources in Mexico. During 2017 Silver Bull plans to refine the metallurgy on this zinc zone, the last piece of information ultimately needed to commence a preliminary economic assessment on the zinc zone. Sample Analysis and QA/QC: All samples have been analyzed at Bureau Veritas in Vancouver, BC, Canada. Samples are first tested with the "MA300" procedure which analyzes for 36 elements using a 4 acid digestion. Samples with silver values above 100ppm are re-analyzed using the FA350 procedure which is a fire assay with a gravimetric finish. Samples with zinc, lead, and copper values above 10,000ppm (1%) are re-analyzed using the AR402 procedure which is a near total aqua regia digestion. A rigorous procedure is in place regarding sample collection, chain of custody and data entry. Certified standards and blanks, as well as duplicate samples are routinely inserted into sample shipments to ensure integrity of the assay process.